And it's set to drive scientific discovery forward. The construction of the world’s largest telescope has begun. At a ceremony at the European Southern Observatory’s (ESO) Paranal Observatory in Chile, officials gathered to celebrate the first stone of the European Extremely Large Telescope’s (E-ELT) long-awaited construction. Sophisticated telescope projects like the E-ELT take many years, so we can expect another similar ceremony sometime in 2021, when the E-ELT will see first light. The E-ELT is the ESO’s flagship observatory. It’s primary mirror will be a 39.3 meter (129 ft.) monstrosity that will observe in the visible, near-infrared, and mid-infrared spectra. The construction of the site began in 2014, but this ceremony marks the beginning of the construction of the main telescope and its dome. The ceremony also marks the connection of the telescope to the electricity grid. The Chilean President, Michelle Bachelet Jeria, attended the ceremony. She was welcomed by the Director General of ESO Tim de Zeeuw, by ELT Programme Manager Roberto Tamai, and by other officials from the ESO. Staff from the La Silla Paranal Observatory, and numerous engineers and technicians—as well as numerous representatives from Chilean government and industry—also attended the ceremony. At the ceremony, a time capsule from ESO was sealed into place. The capsule is a hexagon shaped, one-fifth scale model of the E-ELT containing a poster made of photographs of current ESO staff, and a copy of the book detailing the E-ELT’s science goals. The first stone ceremony is definitely an important milestone for this Super Telescope, but it’s just one of the milestones reached by the E-ELT in the past two weeks. The secondary mirror for the E-ELT has already been cast, and the ESO has announced that the contracts for the primary mirror have now been signed. The primary mirror segment blanks, all 798 of them, will be made by the Germany company SCHOTT. Once produced, they will be polished by the French company Safran Reosc. Safran Reosc will also mount and test the mirror segments. 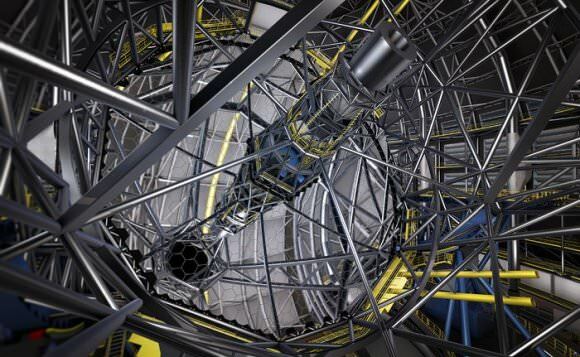 It’s taken an enormous amount of work to get to the construction stage of the world’s largest telescope. Scientist’s, engineers, and technicians have been working for years to get this far. But without the contribution of Chile, none of it would happen. Chile is the world’s astronomy capital, and they continue working with the ESO and other nations to drive scientific discovery forward. Along the way, it will no doubt raise new questions that we can’t even imagine yet.